Plants tightly cespitose, not rhizomatous. Culms 15-25 cm tall, 0.5-1 mm thick, glabrous; nodes 2-3. Basal sheaths mostly glabrous, pubescent at the base, throats glabrous; collars, including the sides, glabrous; basal ligules 0.2-0.3 mm, obtuse to rounded, glabrous; upper ligules to 0.5 mm, rounded to broadly acute; blades 0.4-0.7 mm wide, arcuate, abaxial surfaces smooth or scabridulous, adaxial surfaces with hairs shorter than 0.5 mm. Panicles 3-6.5 cm long, 0.3-0.7 cm wide; branches appressed, lower branches 1-5 cm, with 1-5 spikelets. 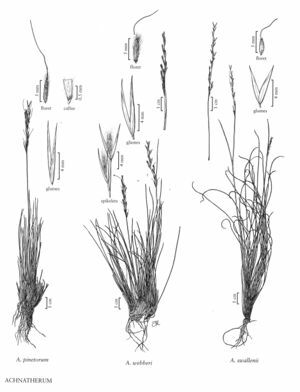 Glumes subequal, 4-5.5 mm, not saccate, apices narrowly acute to acuminate, midveins often prolonged into an awnlike tip; lower glumes 0.6-1 mm wide, apices narrowly acute; florets 2.5-3.5 mm long, 0.6-0.8 mm thick, fusiform, terete; calluses 0.1-0.2 mm, blunt; lemmas evenly hairy, hairs 0.3-0.5 mm, all similar in length, apical lobes 0.3-0.5 mm, thickly membranous; awns 5-6 mm, once-geniculate, readily deciduous, basal segment scabridulous; paleas 2.2-2.5 mm, slightly shorter than the lemmas; anthers 1.5-2 mm, dehiscent, not penicillate. Caryopses 2-3 mm, ovoid. 2n = 34. Achnatherum swallenii grows on open, rocky sites, frequently with low sagebrush, in Idaho and western Wyoming, at 1500-2200 m. It is a dominant species in parts of eastern Idaho, although it is poorly represented in collections.